A potential new blood test is sensitive enough to detect changes in numbers of head and neck cancer cells circulating in the blood, a pilot study by UNC Lineberger Comprehensive Cancer Center researchers and collaborators has found. The findings from the study will be presented at the American Association for Cancer Research Annual Meeting in New Orleans on Tuesday, April 19. 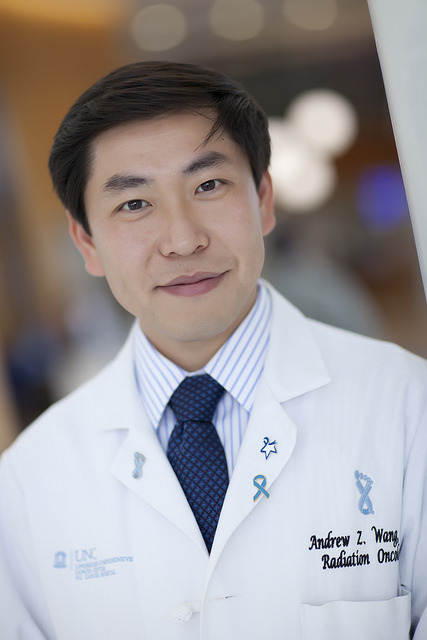 Andrew Wang, MD, is a UNC Lineberger member and an associate professor in the UNC School of Medicine Department of Radiation Oncology. A potential new blood test is sensitive enough to detect changes in numbers of head and neck cancer cells circulating in the blood, a pilot study by UNC Lineberger Comprehensive Cancer Center researchers and collaborators has found. Based on the study findings, researchers say the test could be used to gauge whether patients are responding to cancer treatment. The findings will be presented from 1-5 p.m. on Tuesday, April 19, CST, at the American Association for Cancer Research Annual Meeting in New Orleans. The new potential test was developed by researchers at UNC Lineberger and the University of Illinois at Chicago. It is designed to more effectively capture tumor cells flowing through the blood by slowing them, and rolling them over a surface, Wang said, and captures them using nanoparticles. In the pilot study, the researchers used the test to measure circulating tumor cells in 35 patients undergoing radiation treatment or radiation plus chemotherapy. They found circulating tumor cells in all of the patients prior to radiation treatment. When they measured circulating tumor cells in patients during and after treatment, they found lower levels of head and neck cancer cells after completion of treatment in most patients. Importantly, their results also suggest that the way tumor cell numbers change with treatment may predict which patients are unlikely to be cured with standard treatments. Patients whose tumor cell numbers did not steadily decline during radiation were more likely to have residual cancer after treatment was complete than those whose numbers quickly decreased. “Predictive tests such as this may be able to help us more accurately determine which patients are likely to benefit from additional treatment,” said Joseph Caster, MD, PhD, one of the study co-investigators and chief resident in the UNC School of Medicine Department of Radiation Oncology.